Can you Pyroblast a Seat of the Synod?? SirChris39 Great Furnace would work if you have artifact synergies such as Shrapnel Blast . multimedia on Izzet Artificial Life? Yes. Yes it Is. Tezzeret the Seeker : repeatable artifact untap, tutor/put artifact you search for onto the battlefield and can be a win condition with artifacts. Tezz is the most expensive price card I'm suggesting, but he really does it all for artifact strategies. 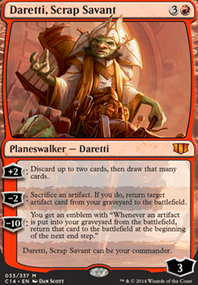 Daretti, Scrap Savant : repeatable draw/graveyard enabler/artifact reanimation, sac a Thopter/Servo to reanimate an artifact. Inventors' Fair : artifact tutor and life gain. 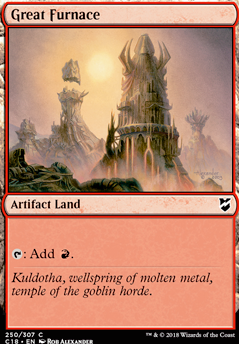 Spire of Industry : rainbow land with an artifact or can make colorless mana. Great Furnace : red artifact land. Shivan Reef : Izzet Pain land, ETB untapped. Ash Barrens : basic landcycling or can ETB untapped to make colorless mana. Kuldotha Forgemaster : repeatable artifact tutor, sac Thopters/Servos to tutor for and put onto the battlefield an artifact. 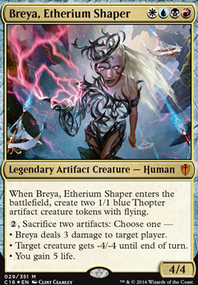 Sai, Master Thopterist : great repeatable value when casting artifacts, more draw with Thopters/Servos. 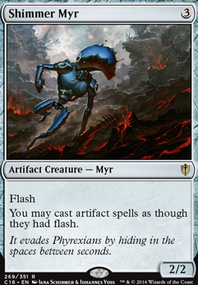 Shimmer Myr : cast artifacts at instant speed, great with Unwinding Clock. Padeem, Consul of Innovation : protect artifacts from targeted removal and can be repeatable draw. Goblin Welder : instant speed repeatable artifact reanimation, sac a Thopter/Servo to reanimate an artifact. Treasure Mage : lots of good six or more CMC artifacts to tutor for. Memnarch : mana sink, turn your opponents permanents into artifacts and steal them. Bosh, Iron Golem : mana sink, sac artifacts you control to do damage to your opponents. Metalwork Colossus : good with Bosh since it can be recurred. Spine of Ish Sah : permanent removal, good with Bosh since when it dies it goes back to your hand. Nevinyrral's Disk : repeatable mass removal that's good with Planeswalkers since it doesn't kill them, can be reanimated or recurred since it's an artifact. Sharding Sphinx : army in a can with Thopters/Servos. Basalt Monolith : good with Tezzeret and Unwinding Clock. Hedron Archive : same as Monolith, but also sac to draw. Mystic Remora : one of the best sources of no mana cost repeatable draw in multiplayer Commander. Brainstorm : instant draw three for one mana. Good luck with your deck. Good thing I only have to remove 5 card! What do you think of Student of Warfare for this deck? I think I have one lying around. Same with Belligerent Hatchling , maybe deserves a spot here? Love the land suggestions. Great Furnace is funny. I'm sure I have one, was sure I had it in this deck. I can't find it. I three times put it in my order list on Card Kingdom, 3 times I didn't realize I took it off. Definitely going in when I do get it. I completely agree with the chopping block cards. Would make room for Smothering Tithe , Enlightened Tutor , and Grand Abolisher and the like. The majority of these cards are only good when you have a big army. By themselves they're kind of lackluster. Great Furnace : the red artifact land. Ash Barrens : basic landcycling. Naya Panorama : fetch land that can ETB untapped to make colorless mana. Reliquary Tower : no max hand size. The cycle lands are nice, but only in small quantities. 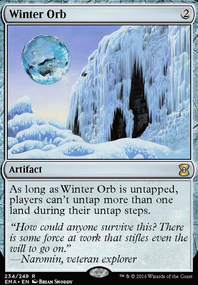 They do ETB tapped after all; if you play too many of them it increases the chances of having to play one as your land drop instead of cycling it and that can be a hindrance, slowing you down. Barrens and Panoramas are in my opinion budget upgrades for Wilds and Expanse. 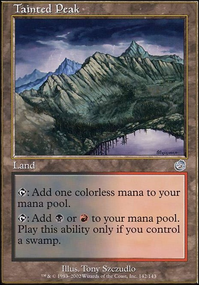 Either of these lands can ETB untapped to make colorless mana or be used to find a basic land. Barrens is an underrated land. It can be played in just about any budget deck that has basic lands. Dude, I've gotta ask that you please stop running Crumbling Necropolis , Arcane Sanctum , and Undiscovered Paradise if possible. Any combination of Glimmervoid , Tolaria West , Academy Ruins , or the artifact lands ( Ancient Den , Seat of the Synod , Vault of Whispers , and Great Furnace ) would be so much better than a tapped land, especially when you're only running 28. I like this ping ping thing you have here. I agree with Traumitz that Great Furnace and Vault of Whispers would be great additions to this deck. With those additions, you could consider replacing some Renegade Map and Traveler's Amulet with Expedition Map in order to grab the artifact lands. Given that your mana curve is so low, I wonder if you need so much land fetching. Consider more draw. I like Costly Plunder , maybe even more than I like Sign in Blood here. 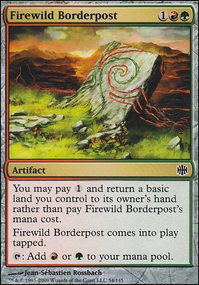 If your lands were artifacts and you had too many, you could sacrifice them to Costly Plunder for value$$. For three mana you could include protection in the form of Herbal Poultice . It fits the theme, protects and triggers but the mana cost is steep. Pyrite Spellbomb and maybe even Blazing Torch can act as removal. Ornithopter seems out of place in this deck unless you NEED a zero mana creature or a powerless flying blocker. 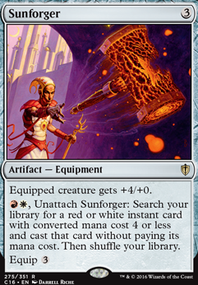 If you can push it to one mana you could get a lot more value out of Myr Servitor and sac outlets such is Costly Plunder or ¿ Ashnod's Altar ? Maybe I'm missing something, but looking at the deck Darksteel Citadel and Great Furnace seem maybe a little weak here. Goblin Welder interacts well with them, but wouldn't it just be more beneficial to run more mountains so that cards like Price of Progress and Acidic Soil become even more one sided? Artifact lands can also be hit by mass artifact removal as well, although darksteel citadel is much less susceptible to that. Maybe I'm missing some of the positive interactions though. I'd really appreciate hearing your reasoning for including them.